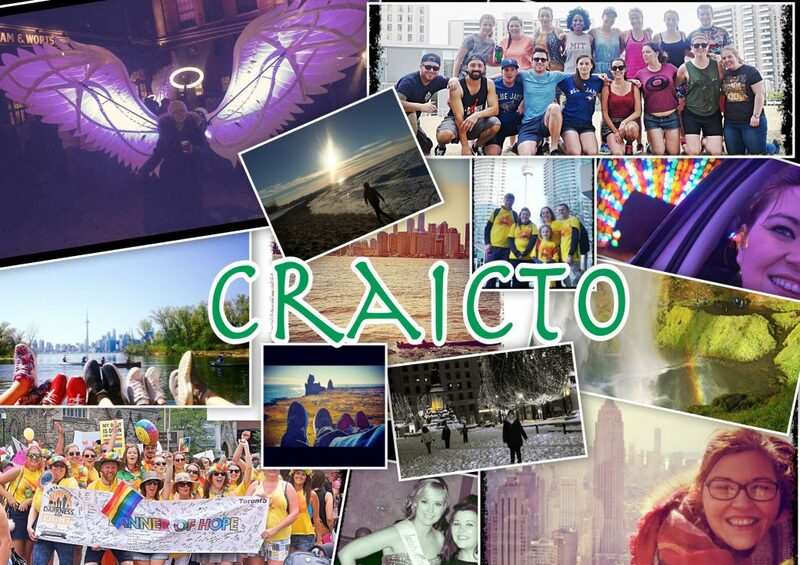 One of the things that often comes up when a group of Irish expats get together is the chat of what we miss from home. Obviously there’s the big ones like family and friends but inevitably food will come up….for me it’s a Curley Wurley and Pickled Onion Monster Munch. Care Packages are always one of the best things to receive in the post, especially if your spending Christmas away from home. 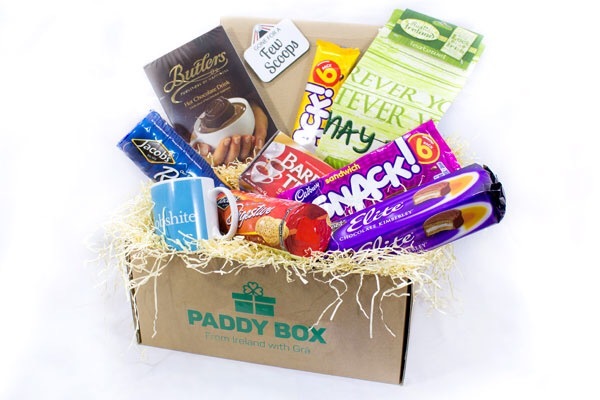 Your mam has definitely sent you a care package or two, and we know that serious effort goes into each item chosen. These items are sourced from all over and not only does she spend a fortune, but then posting the bloody thing would near break the bank!! 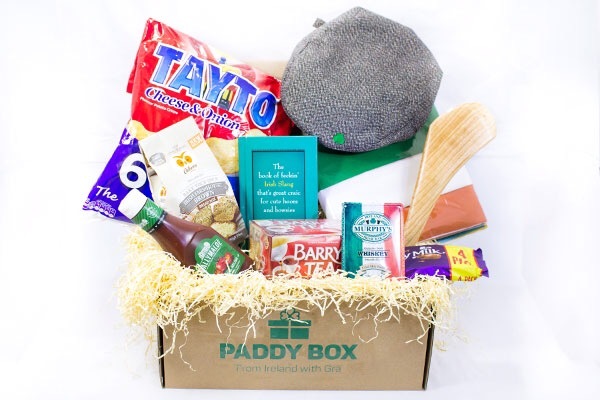 Cue one of the best ideas I’ve seen in a long time, The Paddy Box….. these lads had the brainwave after seeing friends and family emigrating over the years! Each care package comes with 10 different goodies from home! You can also include a personal note which is then shipped ‘with Grá’ to anywhere on the world. 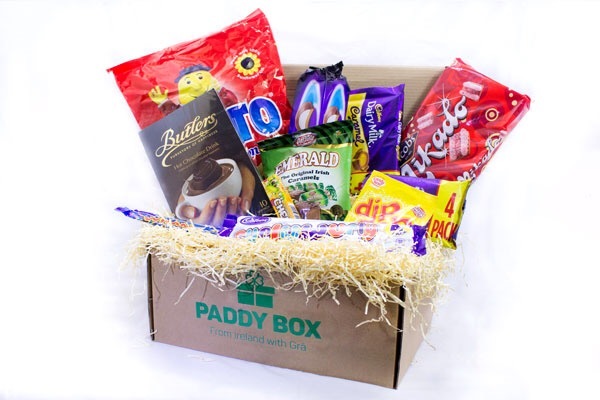 There’s a choice of classic Irish favourites like Barry’s tea, Tayto crisps, McDonnell’s Curry sauce and Cadbury’s chocolate, and more! 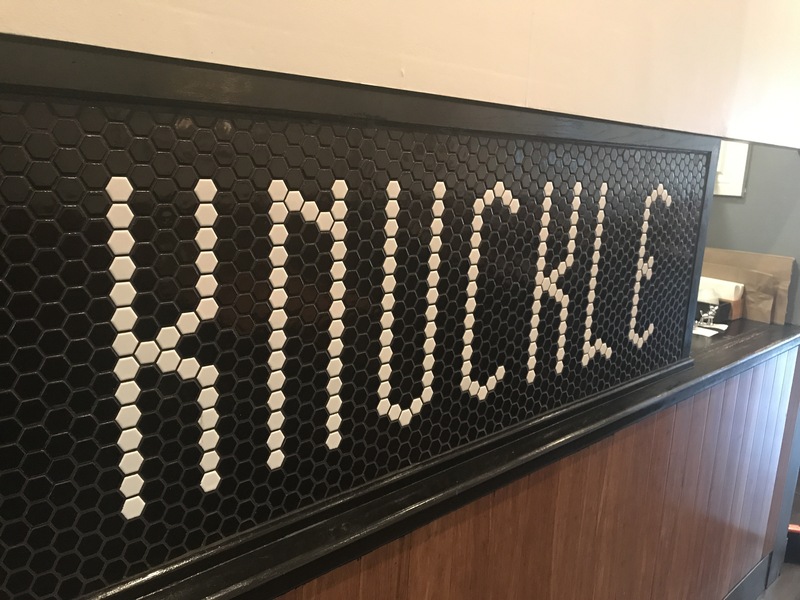 Have you had a Knuckle sandwich?! 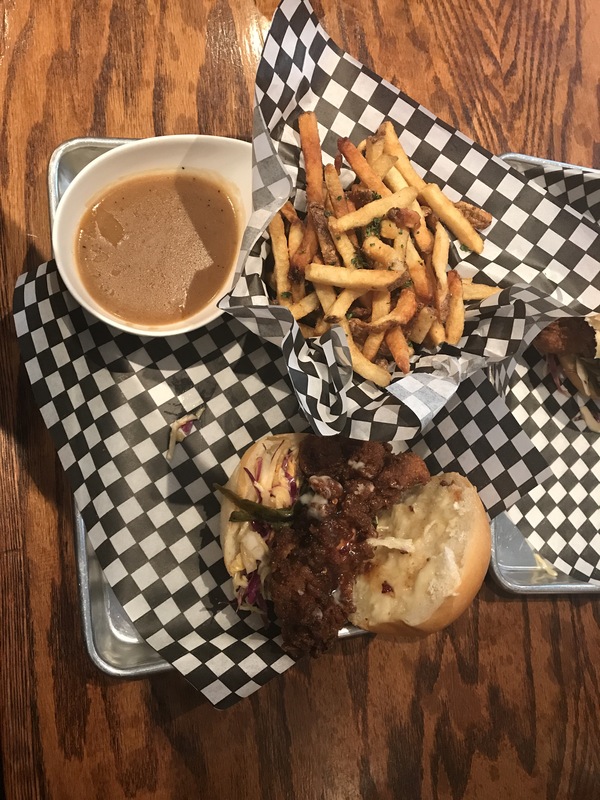 Since moving to Toronto, I’ve been on the eternal quest for a decent Chicken burger! This search has honestly taken me all over the city…but finally I think I’ve found the place! 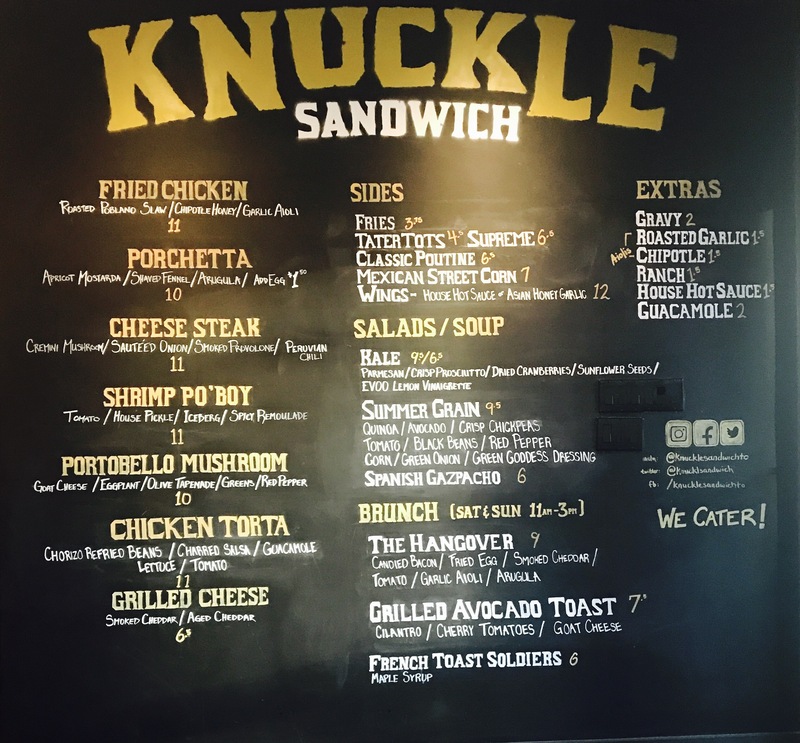 Knuckle Sandwich in East York has a menu dedicated to soups, salads, and a selection of massive sandwiches. They also have a deadly selection of craft beers. I had the Fried chicken on roasted poblano slaw, topped with chipotle honey and garlic aïoli. $11. It did not disappoint! The place is small a rustic-looking room and the whole time we were there, the kitchen was busy cranking out sandwiches and filling take out orders. The street-facing patio is licensed for 14 and was buzzing. The best Fried Chicken, I’ve ever tasted. Located on Parliament and Carlton, Kanpai is the only Taiwanese fried chicken place in the city. Every day every table in the place is occupied. It’s a casual setting that attracts families early in the evening but you can also take advantage of the late night kitchen and unique bar program. We went on Saturday and we certainly weren’t disappointed. The menu is rich with old-school rap references, and contains a collection of small plates primarily priced between $4 and $8 that are influenced by Japanese, Korean, Dutch, and even Hakka cuisines. We tried a wide selection of their dishes, alongside the chicken obviously. The Taiwanese fried chicken, TFC, is crispy skinned poultry which is seriously moist. You can have it by the bucket ($19) or as a three piece order ($8). It comes topped with chilli peppers, cilantro, and scallions alongside a little pot of sweet chilli-spiked sauce. The sides we had (with the promise to share) were so good that we reluctantly passed the around. I had the “Ain’t nothing but a green bean baby” and they were soooo good! Beers are $6 and only $4 a Jameson, sure I thought Gavin was gona stay the night! Located just north of Yonge and Eglinton a short walk past Montgomery and Boardway Avenue, this unique Italian serves up quality food and atmosphere like none other. With its charming decor, friendly staff and captivating music, it feels like you are somewhere else. I came across this romantic Italian two years ago and have been going back ever since. Great music and lighting really sets the scene for a romantic night. It’s a good choice if you are looking for that somewhere special to go with your someone special. No need for starter here, they give you a cute little bread basket with oils, on the house. The staff here are very friendly and attentive A+ from me. They also have a beautiful open fire stone oven so you can watch your pizza cook. I’m about to make a BOLD statement here ; they serve the best spaghetti carbonara I have ever tasted in Toronto. I don’t know how they make it but it is amazing. The portion you see in the picture is a dinner size and more than enough to fill any famished individual. Who loves a good cheesecake? I am not a dessert person, I can safely say I prefer the bread basket, but this cheesecake was delicious, thanks to my date for sharing with me…. The menu is reasonable priced and what you would expect to pay for good quality food and service. I have heard their brunch is one of the best in town, it is on my list for the next trip to Amore! Serving lunch, dinner and weekend brunch. What happens when you bring a dinosaur to the ROM?! If you haven’t been yet, GO! A gang of us headed down on a freezing Friday night 2014, and I’m not going to lie I was a little skeptical…..A night out in a museum, hardly sounds thrilling, I thought it would be all roped off and stuffy suited types, with people telling us off for having too much craic! Sticking with the theme of the night, we had our very own gold T-Rex in tow and he was a hit. This is the city’s most unique social destination featuring eclectic eats, drinks, DJs, dancing, live music and unexpected experiences. Having missed out last year, we’ll be back this year. You can sign up for early bird tickets here, and if you don’t manage to get them you should turn up super early, and be prepared to queue. 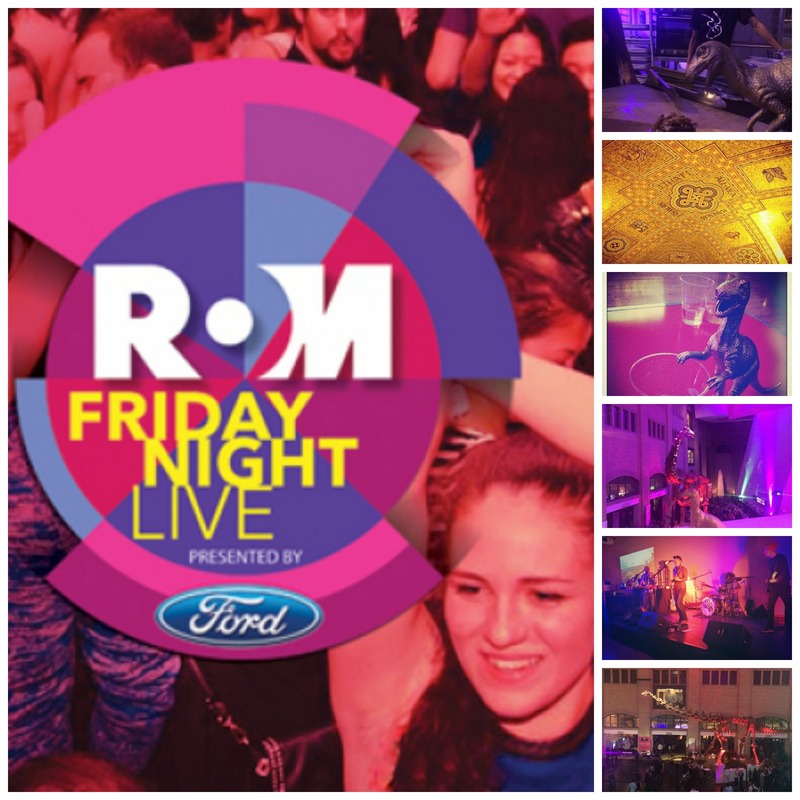 FNL returns again in the summer, so if you miss out you will get another chance. You’ll queue again for the cloak room and again for ROM bucks. Is it worth all the queueing…..Yes! The bar moves quick, thanks to the ROM bucks. The place is so huge it won’t feel jam packed, and its a unique way to see the ROM. Sweet Jesus….all about that ice cream! Ice cream, really seems to be having a moment right now, and with the scorching temperatures over the last few days who can blame us for flocking to our local I cream spot!? A few Sundays ago, after Ireland’s miserable defeat at the hands of France, myself and Brian (a fellow ice cream devotee) took ourselves on what felt like an epic journey to the entertainment district, 106 John Street to be exact. 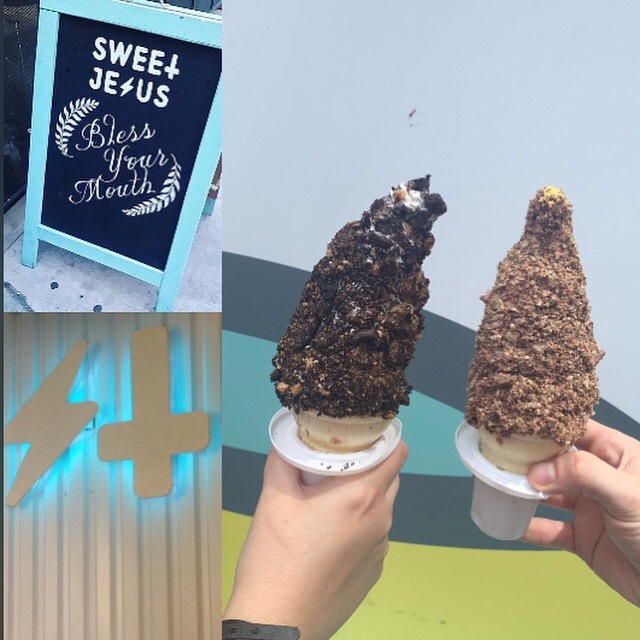 After a good 10minutes of abysmal attempts at parking, I finally got to try the icecream that is blowing up Instagram…..Was it worth it abso-bloody-luty! I had the Cookies Cookies Cookies and cream and Brian had the Ferraro Roche. The actual soft serve ice cream is delicious, and not too sweet, paired with the mounds of toppings it is an epic treat. Now your probably going to want to take a photo of your dessert, but be warned these things are heavy. We ate outside, there is no inside seating. I don’t think there was much communication from the moment we got the cones, until every bite was gone. Now I hear there is a second location coming to Eglinton, I’m sure I’ll go again. The question is, where to try next?! If you have any suggestions, send them our way, we are savage ice cream fans! After hearing so much about Belfast Love, I decided to head down and see what all the fuss was about. 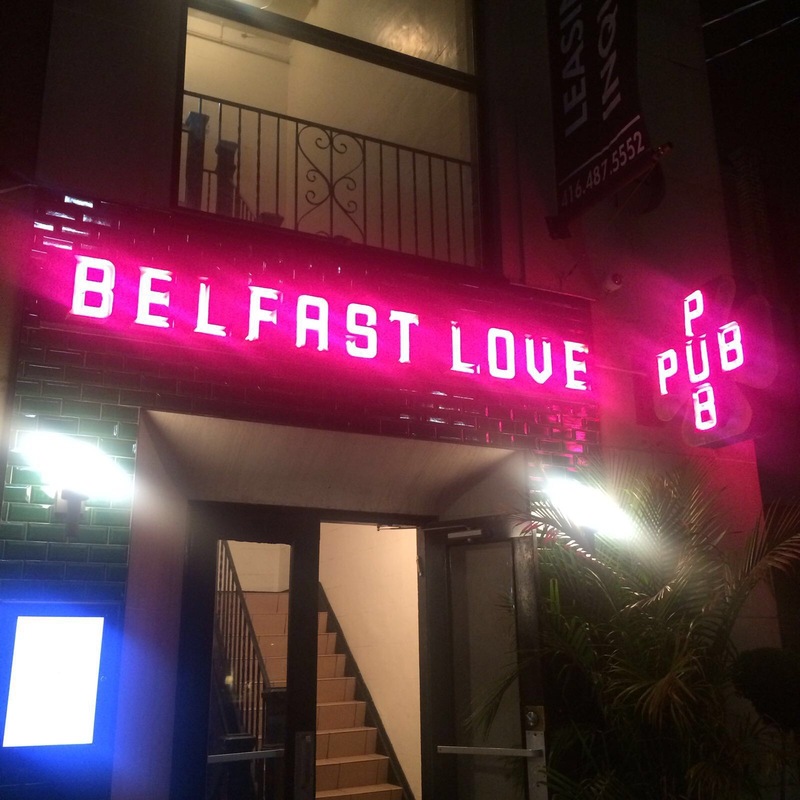 Now before I continue, Belfast love is NOT an Irish bar, nor does it claim to be! It does however have subtle nods to Ireland with the Four leaf clover sign, the awesome walls of Waterford crystal and an extensive Irish whiskey selection. The first thing that I noted was the atmosphere, the place was buzzing and the patio was packed (despite the lack of sunshine). Inside the decor is really cool, think neon “loo” signs, dark lighting, naked lady wall paper and crystal so much crystal! Belfast Love is a proper high end pub. I especially love that there’s lots of different seating sections and a pool table, this place really uses the space well. The only draw back for me was the acoustics, I found it really difficult to hear the people at my table, but the place was packed so am I just nit picking?! Now down to the reason I was there…food and drinks. The drinks list is varied, with a big focus on whiskey, with an option to buy a barrel to be enjoyed any time you stop in, nice touch Belfast Love! The food is not your average pub fare but is still unpretentious. 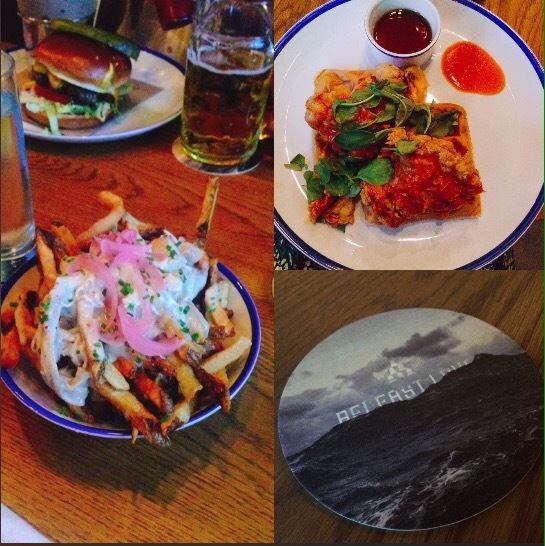 We got a wide variety of the dishes, pizza, poutine, burgers and the chicken and waffles! All of which had a little something unique to this pub, for example, the chicken and waffles were fab but then paired with a sauce of bourbon and maple syrup……amazing! My poutine was not the regular old fries and cheese curds much to the disappointment of the Montrealer among us, but to me it was like a cheesy gravy chip from home, with the added bonus of super fresh rotisserie chicken chunks on top. The pizza looked amazing, freshly made with a super thin crust, I will be back for sure the try it! There are lots of staff floating around the bar. All of whom are very beautiful and actually really sound, Well the two that I interacted with were! Now the smart thing to do would be remember names, which I don’t, but I know both our servers had links to Ireland (Limerick and Ballybunion) and they chatted away, not in a tip hungry way but in a genuine dead on way! Plus we got some of the Belfast Love badges so yay happy campers! My advice go check out Belfast Love, I’ll be aiming for a spot on the patio for my next visit, I just need the sunshine to come back!